Check out our top picks of the best dab rigs of 2019. We want to help everyone who is interested in purchasing their first dab rig so please read our full reviews before you make any decisions. Keep your eyes out for smaller dab rigs because they hit a lot smoother. You also want your dab rig to have at least one percolator. The percolator diffuses the vapors and makes the hit much smoother. We test each brand ourselves and take the durability, the quality, the flavor, and other aspects into consideration before we recommend them. Our recommendations are not for everyone and should be used as guidance towards your next purchase of a dab rig. Concentrate jar rig in a small package! The perfect oil accessory for your dabbing needs. From Rehab Glass this concentrate pipe comes from Southern California. 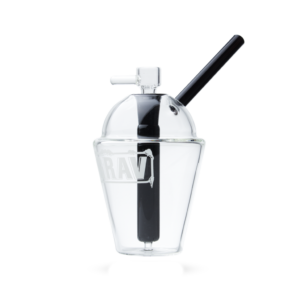 The Mini-Sippy features a quartz banger and diffused downstem. This standard oil accessory is positive to make your smoking experience much easier. These micro rigs are completely clear and are made up entirely of quartz! This little beaker rig is stemless and fixed, so no rattling accessories to transport. The Solid Quartz Shortie is absolutely perfect for hassle-free travel and on the go seshes, so snag one today! A gold fumed mini water pipe This Pan Mini Beaker is the perfect travel pipe. Crafted by Sesh Supply, this water pipe was designed in Savannah, GA. Only five inches tall, this pipe fits a lot in a small space. 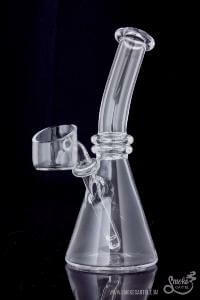 The fumed body creates an awesome heady aesthetic generally reserved for pieces thrice the price. The three hole diffuser offers excellent flavor at no expense to your lungs. Though this pipe comes with a flower bowl, its small size make it perfect for concentrate use. Throw a banger on this nano to really upgrade your dab-game! Small rig with a great shape! These bent neck concentrate pipes are great for concentrates. The base and lip is accented with color. Behind the Camo branding on the side sits a diffused downstem that provides an esteemed intake. The piece comes with a male joint and a quartz banger. Perfect for on the go when you need to stay classy. 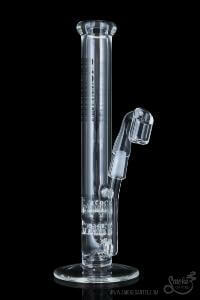 Sturdy pipe with a small footprint If you are limited on space, or if you just interested pieces on the smaller side you will like one of these mini tubes from UPC. Traditionally styled with two honeycomb discs for percolation. A 3in base for stability and thick walls for durability. They are made for quick rips of your legal oils and ships with a nail with a polished joint. Available with a 10mm joint or a 14.5mm joint. Grab one of these daily drivers today! 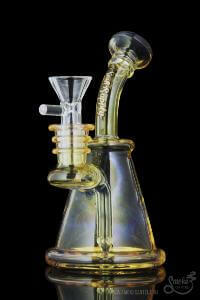 This piece is a honeycomb disc to a turbine percolator, in a sidecar style. This sidecar arm makes it difficult for water to splash into your mouth, effectively working as a splashguard. This is a portable piece, and the sidecar piece allows the smoke to travel in a different, delightful fashion. This piece includes a glass dome and nail! Prefer vaping your flower? Visit our top dry herb vaporizer reviews! Dab rigs are a kind of a concentrate water pipe which are used to smoke legal, essential oils and concentrates. They make smoking easily as the smoke produced in it is not actually the smoke but the vapors that deliver the best essence of the product. Concentrates like oil and wax (dabs) have always been around but dabbing didn’t take off until recently. For a very long time dabbing was never popular and many concentrate dabs were made at home. Due to recent legalization of marijuana in some states, dabs have lead to the development and growth of marijuana rigs. Many people would say the trend started back in 2010 because of the legalization activities. Some people also believe dab rigs are a healthier alternative to smoking the flower. 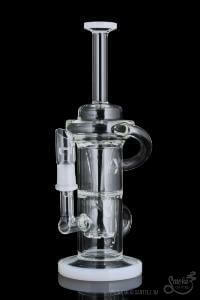 Around 2012 many new shops and online head shops started offering rigs of all kinds for sale. The demand is still constantly growing and has a tremendous momentum. Dabbing has increasingly become popular in recent years, as it gives smokers a safer and healthier way to enjoy their concentrates. Dab rigs and concentrate pipes are constantly increasing demand. The increase in the demands is a sign of the increased numbers of people that are now looking for a more real and enjoyable smoking satisfaction. As dabbing gains popularity, the new devices for enjoying different extracts are popping up all over. 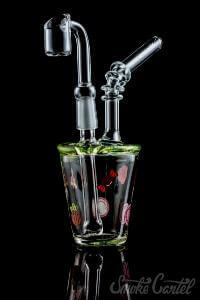 Dab rigs cost anywhere between $30 and a several hundreds of dollars depending on the complexity of the rig. Finding the best dab rigs can be hard, luckily we are here to help. If you’ve never tried dabbing but are looking for alternatives to smoking, a dab rig may be just the thing for you. Despite most dab rigs being similar and carry out the same function, there are several factors that may influence an individual choice when it comes to buying. Who Would Want A Dab Rig? If you had the opportunity to try an oil rig , and you plan on converting to the much healthier option, it is best if you invest in a well-built rig. Tip: If you have an old bong lying around you can use it as the base and create your own rig for a fraction of the price. If you have never tried dabs then it would be best for you to visit our Dabs & Rigs 101 page for more information. Dabbing is essential for those who dislike the usual ‘out of there’ mentality that you get with smoking flowers. It also allows you to feel the side effects for a much longer duration. Convenience – You will have everything you need to quickly take a dab. Safety – You are dealing with torches and high temperatures, not using the right equipment could result in small burns. Style – Just Like all best bongs, dab rigs are usually the works of art. There are many different styles and pieces to choose from that allow you to mix and match to create personal one-of-a-kind set up. Health Benefits – You may find health benefits yourself with dabbing. Many people argue smoking vapor is healthier than typical marijuana plant and we have to agree. Taste – The best and quality concentrate oil gives the best smooth hits that won’t leave you with coughing up your lungs. Sweet Smell – A lot of people like oil because it does not leave a pungent marijuana smell. Depending on your oil you can smoke indoors without the worries of anyone identifying the odor. Cleaner Feel– The first thing you notice with concentrate oil is they give you a much cleaner experience. Dabs have been said to provide more focus and to have higher medicinal benefits than the regular flower. When looking for your first oil rig it is best you get the right rig with the proper attachments. If you decide to purchase a poorly designed rig made with thin glass it may result in your glass rig cracking or shattering under pressure. Nothing is more frustrating when you are dabbing and you hear the glass start to crack as you take your dab. Talk about buzz kill. These problems can be avoided by purchasing top quality rigs, and choosing the proper attachments. Visit our headshop coupon page to save on your next rig set up purchase! Great site, and now I know where to go for a good rig. I'll pick one up locally before I pick up my medicine. If I was to ever to take up dabbing again, I now know what kind of rigs to look for. Only high-quality glass dab rigs are the way to go. I have to say, when I started reading you sounded like you were speaking a new language. Never heard of 'dab rigs' however, your images quickly confirmed what these instruments were. Hey bro, great article on dab rigs! It is great to see the results of this technology and how it affects the market. Those who are interested in dab rigs will find your reviews insightful and helpful. Thank you. dab rigs and bongs are similar but different because they are used for different things, different method of consumption. Never knew what a dab rig was until I landed here. From what you said, it seems to be related to something similar to hookah. At first, I thought this was reviews of some fancy wine glasses... Is the term 'dab rig' actually mean that hookah looking thing? Completely amazed at how advanced dab rigs have become. I am a member of the community- so to speak and I am excited for what is to come for those of us that choose to dab. 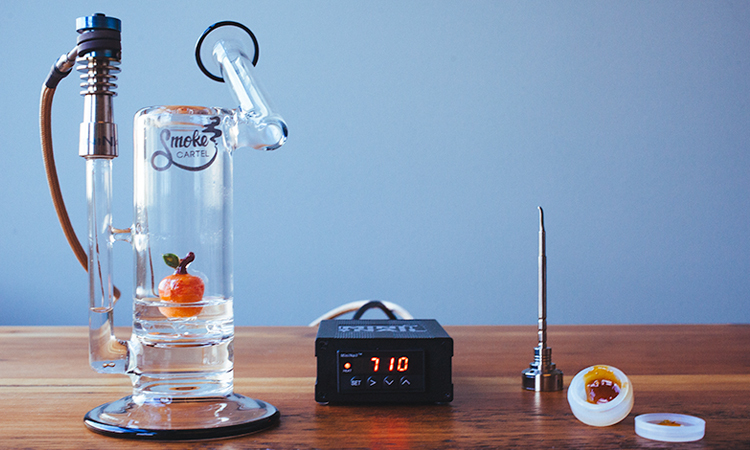 I love this, these dab rigs offer a new alternative to the traditional way flowers are smoked. I found your dab rig reviews to be informative and helpful. I like the Dandi bent neck coin rig with the diffused downstem. Finished reading your best dab rigs reviews. This is one of the best review sites that I've been to in a long time.